Whew, what a week. I can't even remember half of the things that went on but I am glad last week is over and I can't say I am looking forward to starting another week, and I have only made it through two weeks of the school year. My goal is to have a boring, routine week where I come home directly from work without any urgent errands or emergencies and I have the evening to relax. I'm not sure that will happen for another two years. Last week started with my nephew having Monday off. I planned to take him to the Minute Clinic after work for a sports physical but when we got there we were too late for the last appointment. We grabbed a pizza, stuffed the luggage, groceries, and dogs in the car, and drove out to the mobile home, then unloaded it all. This being split between two houses is difficult. The next day I left work early so that we would make it to the Minute Clinic earlier but, once again, the person signing in ahead of us got the last appointment. There was a map to the next closest clinic so we drove another 15 minutes and no one was ahead of us. With that chore done, we stopped at the house to pick up his laundry from the day before because although he was home ALL DAY LONG on Monday, he brought out his dirty clothes 10 minutes before we were going to leave. Wednesday and Thursday I worked on cleaning and organizing my bedroom. I didn't get far but at least most of the boxes are out of site now. 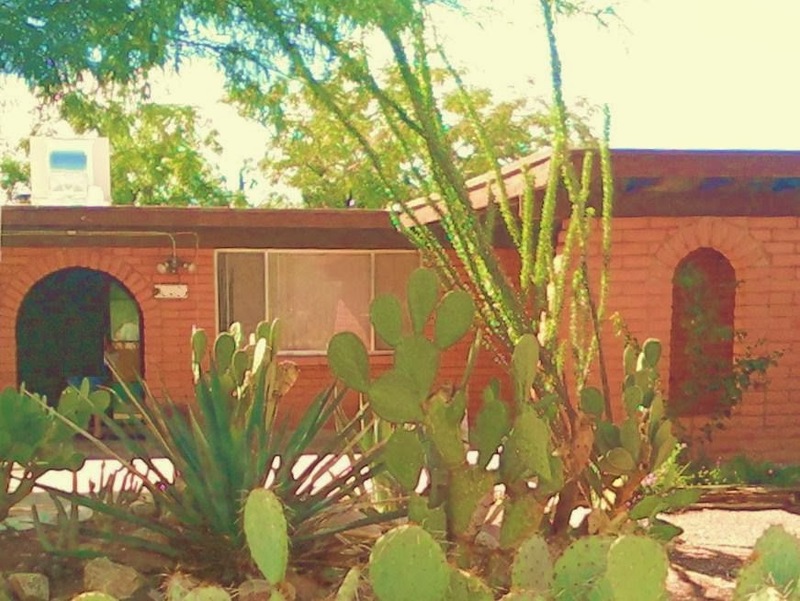 On Friday we loaded up the car again and went back to the house in town where we have the luxury of running water, laundry facilities, a full kitchen, and space. Saturday was his choir get-to-know-you lunch and I dug a hole for the tree that my co-worker's bought me in remembrance of my father. 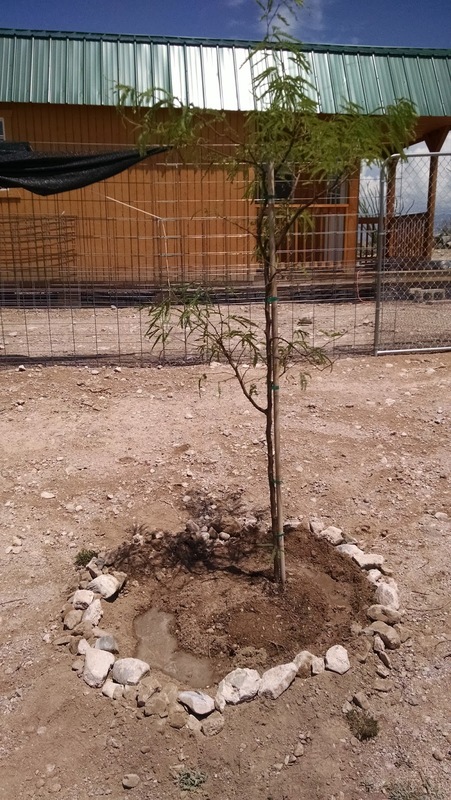 It was a very fitting gift because my father loved to plant trees. I hope I don't kill it. I need to figure out how to send some greywater to it. When I get a washing machine, it will be easy to hook up a drain hose to its location. It was still too hot to do anything more. I didn't try out the PEX pipe yet. 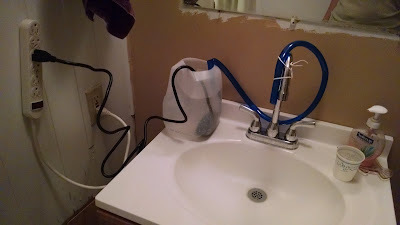 Instead, I rigged up my little aquarium pump to the faucet so that my nephew can wash his hands without having to come out to the kitchen sink. I was thrilled with my little set up because I already had this pump. It didn't cost me a thing and I had it hooked up in minutes. My nephew was not impressed and wanted to know when I was going to get the real water system hooked up. I told him I was waiting for him to volunteer to go under the mobile home to hook up the pipe. Maybe I'll get to it this weekend when I am planning to install the low-flow toilet. So, I survived week two. My job was especially annoying because I had to make up work from missing 3 days from the week before. I took a moment to calculate how much money I would have to live on if I sold both houses at the current zillow price minus the realtor's cut. I would have $1500 a month for the next 15 years when my 401K would then be available. It is tempting but I need money to make this place more comfortable and to finish the inside of the barn-shed. Then I can think about quitting. That's like 3 or 4 years away depending on what cards life decides to deal me in the meantime.